Something extraordinary is happening, ominous yet inspiring, a scant half-mile from the northern border of the Standing Rock Sioux reservation, near Fort Yates, North Dakota. 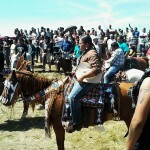 The largest gathering of Native Americans in five generations has convened to support the Standing Rock people in their quest to halt construction of the Dakota Access Pipeline (DAPL). DAPL is a proposed 1,168-mile crude-oil pipeline, designed to link the Bakken oil fields in the Dakotas with distribution terminals in southern Illinois. The pipeline would cross four states, and traverse under the Missouri River. The Standing Rock tribe’s objections to the project hinge on the threat to their reservation’s aquifers, which would be poisoned by pipeline spills. The worry is not an idle one; pipeline maintenance is notoriously lax in the U.S., with regulatory enforcement nearly non-existent. Under these conditions pipelines almost inevitably leak, to devastating effect on the environment, agriculture, and nearby communities. Thus far in 2016, pipeline accidents have resulted in at least 350,000 gallons reported spillage of crude oil, gasoline, propane, and other petroleum byproducts. It’s interesting to note that the original pipeline route proposal would have had it cross the Missouri river north of Bismarck. 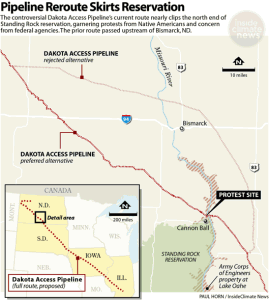 That proposal was rejected, with the pipeline rerouted southward toward Standing Rock, due to perceived dangers to water supplies serving the North Dakota state capital. A second objection of the Standing Rock people, no less urgent, is that construction endangers ancestral lands, burial grounds, and cultural heritage sites along the pipeline route. The U.S. Army Corps of Engineers, which gave final permitting approval for the pipeline in July, says it completed both environmental and archaeological surveys, and accepted public comment during its deliberations prior to approval. The tribe, under legal representation by EarthJustice, a nonprofit environmental law firm, contend that their objections were ignored and that the impact surveys were cursory at best. 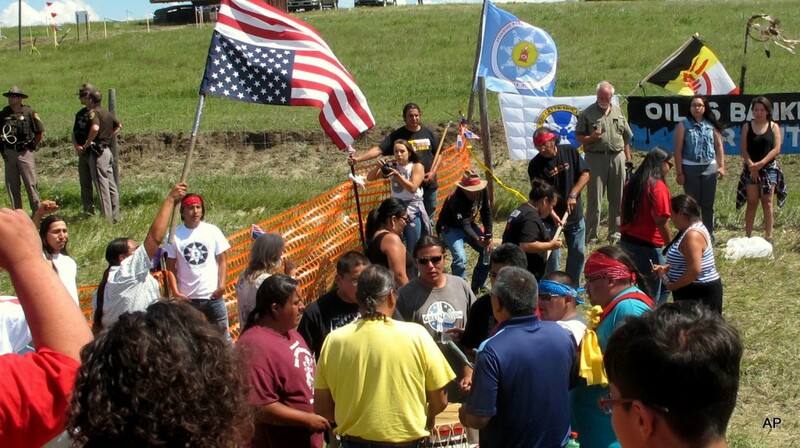 They have filed for an injunction to halt construction of the pipeline, with U.S. District Judge James Boasburg set to issue a ruling by September 9th. Meanwhile the gathering grows, with Native people and others arriving daily at the protest site to support Standing Rock’s struggle. 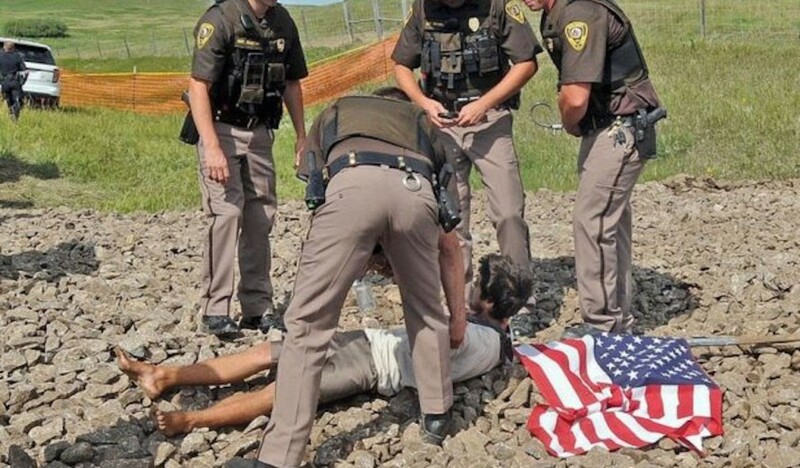 Arrests thus far have mainly been for trespassing, which spotlights an intriguing historical point: the focal area of the protest is considered private property, under lease by the pipeline management company; however this land had previously been part of the Standing Rock reservation, and was seized without consent in 1958 for a dam project by the aforementioned Army Corps of Engineers. This weekend, for the first time, the confrontation became violent. Private security forces employed by the pipeline say they were attacked with sticks and rocks. 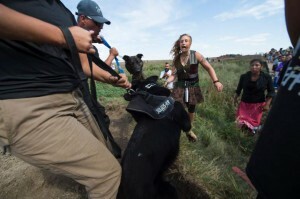 They pepper-sprayed and unleashed guard dogs on protesters. Six people, including a child, were treated for dog bites, and more than 30 were sprayed. State police and local sheriff deputies, observing from the air and from ground stations, did not intervene. 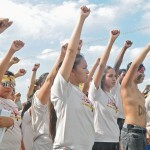 We need to stand with Standing Rock not just because the energy-industrial complex is endangering the planet with an irrational dependency on fossil fuels and 19th-century technology, and not just to begin to set right the long and sordid U.S. history of broken treaties and stolen land (American Indians, with good reason, have a differing and painful definition for the term ‘white lies’). This entry was posted in New Post and tagged #NoDAPL, climate change, Native Americans, protest culture, Standing Rock. Bookmark the permalink.